Attendees of the International Conference on ASEAN Law 2018. The management and staff of Samson Tiara would like to congratulate our colleague Ayu Maulida Sari, S.E., M.H. for being invited to attend the 2018 International Conference on ASEAN Law hosted by the Chang Mai University Faculty of Law in Thailand. 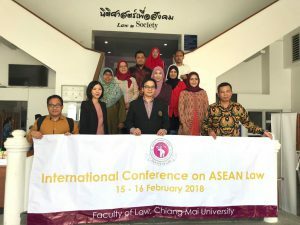 The conference, which ran from the 15th to the 16th of February, aimed to share different perspectives on National law or ASEAN law and to discuss collaboration on academic and mobility programs among institutions. During the conference Ms. Sari presented a lecture based on her paper entitled “Manpower on Multinational Companies and Inconsistency in the regulation of law in Indonesia”.